Don’t be turned off by the long list of ingredients: This recipe is delicious! With bold flavor coming from the dressing and a bowl of fresh greens, this recipe is guaranteed to put a smile on your face. Vegetables can be few and far between on the road. Sit back, relax and enjoy this amazing salad. 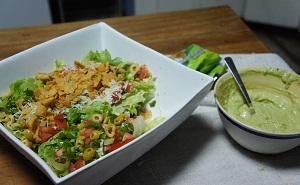 Thank you Jessie at Hostel Casa del Parque in San Jose, Costa Rica for this recipe! Blend all the dressing ingredients together until smooth.